Porto, (also known as Oporto in English) is the second-largest city in Portugal, after Lisbon, as well as one of the major urban areas in Southern Europe and the capital of the second major great urban area in Portugal. In Portuguese the name of the city is spelled with a definite article as o Porto (English: “the port”). Consequently, its English name evolved from a misinterpretation of the oral pronunciation and referred to as Oporto in modern literature and by many speakers. Located along the Douro river estuary in northern Portugal, Porto is one of the oldest European centres, and registered as a World Heritage Site by UNESCO in 1996. Its settlement dates back many centuries, when it was an outpost of the Roman Empire. Its Latin name, Portus Cale, has been referred to as the origin for the name "Portugal", based on transliteration and oral evolution from Latin. The history of Porto dates back to the 4th century, to the Roman occupation of the Iberian Peninsula. Celtic and Proto-Celtic ruins have been discovered in several areas, and their occupation dates about 275 BC by the Bracari. During the Roman occupation, the city developed as an important commercial port, primarily in the trade between Olissipona (the modern Lisbon) and Bracara Augusta (the modern Braga). In 1387, Porto was the site of the marriage of John I of Portugal and Philippa of Lancaster, daughter of John of Gaunt; this symbolized a long-standing military alliance between Portugal and England. The Portuguese-English alliance,(Treaty of Windsor) is the world's oldest recorded military alliance. 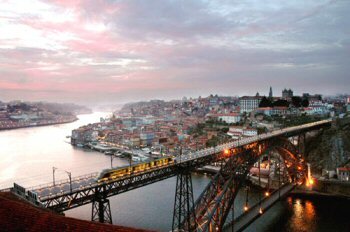 Porto was ranked 1 in the European Best Destinations 2014 awards. In recent years, UNESCO recognised its historic centre as a World Heritage Site. Among the architectural highlights of the city, Porto Cathedral is the oldest surviving structure, together with the small romanesque Church of Cedofeita, the gothic Igreja de São Francisco (Church of Saint Francis), the remnants of the city walls and a few 15th-century houses. When planning your holidays in Porto include your Porto Car Hire online reservation in your early holiday plans. Making your Porto Car Hire reservation ahead you guarantee car hire availability and lower prices and when you arrive your preferred rental car, booked in advance, will be waiting for you at Porto airport or will be delivered in Porto city.